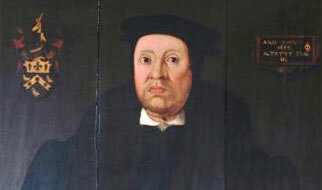 he Benedictine monks of Reading Abbey set out the first gardens at Bucklebury in the twelfth century, creating an elaborate system of seven fishponds (two on Bucklebury Common) which feed into one another. The monks planted a range of herbs and flowers for medicinal purposes. 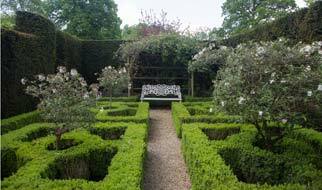 The Winchcombe family set out more formal gardens and parkland including a walled kitchen garden and a bowling green. The gardens fell into a derelict state following the fire at Bucklebury House in 1832 when the family moved to their other home, Lyegrove, in Gloucestershire. 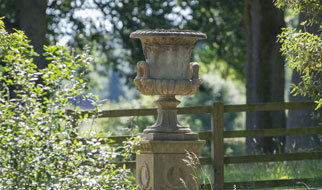 It was not until the early 1990’s that the gardens were redesigned from what were pony paddocks. The principle of the design was to create a series of rooms that would connect with each other. A freelance gardener, Trevor Last (formerly Head Gardener at The Old Rectory, Burghfield) set about creating the hard structure delineated by gravel paths, brick walls, steps and yew hedges. More recently Marina Hartley Russell has remodelled the herbaceous borders and Long Walk to create a stunning vista from the house. The gardens envelop the house and now connect the monastic fishponds and ancient parkland surrounding the house. 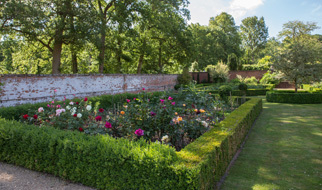 A major part of the project was the restoration of the Walled Kitchen garden which is set out in a symmetrical design using box hedging. Vegetables, fruit and flowers are now grown for the house. 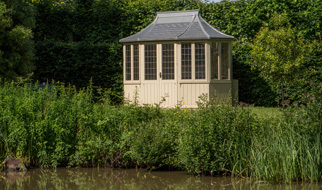 A purpose built greenhouse, designed by Marina Hartley Russell, was added to the kitchen garden in 2015. An armillary sphere was installed in 2016 to mark Marina’s 50th birthday. A small orchard can be found behind the greenhouse. The formal gardens are divided into “rooms”. There is a Potager Garden (herb garden), a Maze Garden (created in the shape of a circle and constructed of turf and bricks) with an obelisk in the middle commemorating the millennium. The main garden to the South of the House is set down to lawn with herbaceous borders; this connects to the Spring Garden. The Spring Garden is planted with spring bulbs which then rotate into a wild flower meadow in summer. The Spring Garden connects to the Woodland Garden, medieval fishponds and parkland beyond. The main thoroughfare through the garden is the Long Walk which connects the Main House with the Fishponds and divides the Walled Garden from the more formal “rooms”. These are accessed through an apple and pear walk trained in a semi arch thus providing shade from the summer sun. The Monastic garden, or Sunken Garden consists of a square pleached lime cloister with a sunken circular garden in the middle. 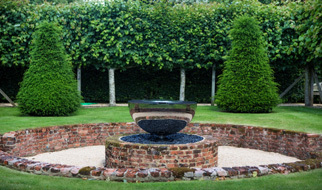 A new Sky Mirror Chalice water feature was installed into the sunken garden in the Summer of 2016 reflecting the ecclesiastical connection to Reading Abbey and providing a focal point within the garden. At the rear of the Monastic garden and Maze garden is a Hazel Walk that connects the Potager Garden with the Fishponds. 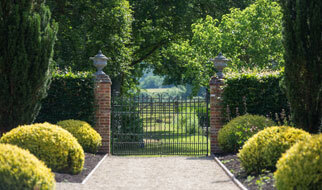 Complementing the formal gardens are large areas of open lawns and parkland. The family have continued a long tradition of planting oak trees in the parkland to mark special birthdays or anniversaries. The original drive to the House was replanted with Oak Trees in 1992 which makes a pleasant approach to the House from the North. New wrought iron gates were erected in 2015 when a major project to repair and rebuild the brick walls around the house. The arms on the gates are of the Winchcombe family. The gardens continue to evolve with new plantings and trees. In 2009 new climbing fruit trees were planted in the walled garden. In 2010 a number of new oaks were planted in the Parkland to the East of the House and a new fruit cage was constructed in the walled garden. Parkland fencing is another feature introduced to the grounds in 2013 and 2015. A new project has been the restoration of Littlefence Wood which sits to the south of the house. The wood contains an amazing collection of ferns, a monastic fishpond as well as carpets of bluebells in the Spring. Willie and Marina Hartley Russell occasionally open the gardens to the public. Overlooking the monastic fish ponds and on across the Pang valley. Set within the walled garden.